The Hyperledger Fabric CA is a Certificate Authority (CA) for Hyperledger Fabric. Hyperledger Fabric CA consists of both a server and a client component as described later in this document. For developers interested in contributing to Hyperledger Fabric CA, see the Fabric CA repository for more information. The diagram below illustrates how the Hyperledger Fabric CA server fits into the overall Hyperledger Fabric architecture. There are two ways of interacting with a Hyperledger Fabric CA server: via the Hyperledger Fabric CA client or through one of the Fabric SDKs. All communication to the Hyperledger Fabric CA server is via REST APIs. See fabric-ca/swagger/swagger-fabric-ca.json for the swagger documentation for these REST APIs. You may view this documentation via the http://editor2.swagger.io online editor. The Hyperledger Fabric CA client or SDK may connect to a server in a cluster of Hyperledger Fabric CA servers. This is illustrated in the top right section of the diagram. The client routes to an HA Proxy endpoint which load balances traffic to one of the fabric-ca-server cluster members. All Hyperledger Fabric CA servers in a cluster share the same database for keeping track of identities and certificates. If LDAP is configured, the identity information is kept in LDAP rather than the database. A server may contain multiple CAs. Each CA is either a root CA or an intermediate CA. Each intermediate CA has a parent CA which is either a root CA or another intermediate CA. For more information on libtool, see https://www.gnu.org/software/libtool. For more information on libltdl-dev, see https://www.gnu.org/software/libtool/manual/html_node/Using-libltdl.html. The following installs both the fabric-ca-server and fabric-ca-client binaries in $GOPATH/bin. The following starts the fabric-ca-server with default settings. The -b option provides the enrollment ID and secret for a bootstrap administrator; this is required if LDAP is not enabled with the “ldap.enabled” setting. A default configuration file named fabric-ca-server-config.yaml is created in the local directory which can be customized. Find the tag that matches the architecture and version of fabric-ca that you want to pull. Navigate to $GOPATH/src/github.com/hyperledger/fabric-ca/docker/server and open up docker-compose.yml in an editor. Change the image line to reflect the tag you found previously. The file may look like this for an x86 architecture for version beta. This will pull down the specified fabric-ca image in the compose file if it does not already exist, and start an instance of the fabric-ca server. You can build and start the server via docker-compose as shown below. The hyperledger/fabric-ca docker image contains both the fabric-ca-server and the fabric-ca-client. This section simply provides the usage messages for the Fabric CA server and client for convenience. Additional usage information is provided in following sections. The following links shows the Server Command Line and Client Command Line. Note that command line options that are string slices (lists) can be specified either by specifying the option with comma-separated list elements or by specifying the option multiple times, each with a string value that make up the list. For example, to specify host1 and host2 for the csr.hosts option, you can either pass --csr.hosts 'host1,host2' or --csr.hosts host1 --csr.hosts host2. When using the former format, please make sure there are no space before or after any commas. In the remainder of this document, we refer to making changes to configuration files. However, configuration file changes can be overridden through environment variables or CLI flags. If we wanted to override both the environment variable and configuration file, we can use a command line flag. The same approach applies to fabric-ca-server, except instead of using FABIRC_CA_CLIENT as the prefix to environment variables, FABRIC_CA_SERVER is used. This section describes the Fabric CA server. You may initialize the Fabric CA server before starting it. This provides an opportunity for you to generate a default configuration file that can be reviewed and customized before starting the server. For the remainder of this server section, we assume that you have set the FABRIC_CA_HOME environment variable to $HOME/fabric-ca/server. The instructions below assume that the server configuration file exists in the server’s home directory. The -b (bootstrap identity) option is required for initialization when LDAP is disabled. At least one bootstrap identity is required to start the Fabric CA server; this identity is the server administrator. The server configuration file contains a Certificate Signing Request (CSR) section that can be configured. The following is a sample CSR. If custom values for the CSR are required, you may customize the configuration file, delete the files specified by the ca.certfile and ca.keyfile configuration items, and then run the fabric-ca-server init -b admin:adminpw command again. The fabric-ca-server init command generates a self-signed CA certificate unless the -u <parent-fabric-ca-server-URL> option is specified. If the -u is specified, the server’s CA certificate is signed by the parent Fabric CA server. In order to authenticate to the parent Fabric CA server, the URL must be of the form <scheme>://<enrollmentID>:<secret>@<host>:<port>, where <enrollmentID> and <secret> correspond to an identity with an ‘hf.IntermediateCA’ attribute whose value equals ‘true’. The fabric-ca-server init command also generates a default configuration file named fabric-ca-server-config.yaml in the server’s home directory. If you want the Fabric CA server to use a CA signing certificate and key file which you provide, you must place your files in the location referenced by ca.certfile and ca.keyfile respectively. Both files must be PEM-encoded and must not be encrypted. More specifically, the contents of the CA certificate file must begin with -----BEGIN CERTIFICATE----- and the contents of the key file must begin with -----BEGIN PRIVATE KEY----- and not -----BEGIN ENCRYPTED PRIVATE KEY-----. The choice of algorithm and key size are based on security needs. If the server has not been previously initialized, it will initialize itself as it starts for the first time. During this initialization, the server will generate the ca-cert.pem and ca-key.pem files if they don’t yet exist and will also create a default configuration file if it does not exist. See the Initialize the Fabric CA server section. Unless the Fabric CA server is configured to use LDAP, it must be configured with at least one pre-registered bootstrap identity to enable you to register and enroll other identities. The -b option specifies the name and password for a bootstrap identity. To cause the Fabric CA server to listen on https rather than http, set tls.enabled to true. SECURITY WARNING: The Fabric CA server should always be started with TLS enabled (tls.enabled set to true). Failure to do so leaves the server vulnerable to an attacker with access to network traffic. To limit the number of times that the same secret (or password) can be used for enrollment, set the registry.maxenrollments in the configuration file to the appropriate value. If you set the value to 1, the Fabric CA server allows passwords to only be used once for a particular enrollment ID. If you set the value to -1, the Fabric CA server places no limit on the number of times that a secret can be reused for enrollment. The default value is -1. Setting the value to 0, the Fabric CA server will disable enrollment for all identities and registration of identities will not be allowed. The Fabric CA server should now be listening on port 7054. You may skip to the Fabric CA Client section if you do not want to configure the Fabric CA server to run in a cluster or to use LDAP. This section describes how to configure the Fabric CA server to connect to PostgreSQL or MySQL databases. The default database is SQLite and the default database file is fabric-ca-server.db in the Fabric CA server’s home directory. certfiles - A list of PEM-encoded trusted root certificate files. Place certificate and key files in the PostgreSQL data directory. Set the clientcert parameter to 1 on the appropriate hostssl line(s) in pg_hba.conf. On MySQL 5.7.X, certain modes affect whether the server permits ‘0000-00-00’ as a valid date. It might be necessary to relax the modes that MySQL server uses. We want to allow the server to be able to accept zero date values. In my.cnf, find the configuration option sql_mode and remove NO_ZERO_DATE if present. Restart MySQL server after making this change. Please refer to the following MySQL documentation on different modes available and select the appropriate settings for the specific version of MySQL that is being used. If connecting over TLS to the MySQL server, the db.tls.client section is also required as described in the PostgreSQL section above. Open or create my.cnf file for the server. Add or uncomment the lines below in the [mysqld] section. These should point to the key and certificates for the server, and the root CA cert. Can run the following query to confirm SSL has been enabled. If you want to give a specific IP address from which the user will access the server change the ‘%’ to the specific IP address. Options for secure connections are similar to those used on the server side. ssl-ca identifies the Certificate Authority (CA) certificate. This option, if used, must specify the same certificate used by the server. ssl-cert identifies MySQL server’s certificate. ssl-key identifies MySQL server’s private key. Suppose that you want to connect using an account that has no special encryption requirements or was created using a GRANT statement that includes the REQUIRE SSL option. As a recommended set of secure-connection options, start the MySQL server with at least –ssl-cert and –ssl-key options. Then set the db.tls.certfiles property in the server configuration file and start the Fabric CA server. To require that a client certificate also be specified, create the account using the REQUIRE X509 option. Then the client must also specify proper client key and certificate files; otherwise, the MySQL server will reject the connection. To specify client key and certificate files for the Fabric CA server, set the db.tls.client.certfile, and db.tls.client.keyfile configuration properties. The Fabric CA server can be configured to read from an LDAP server. retrieve an identity’s attribute values which are used for authorization. Modify the LDAP section of the Fabric CA server’s configuration file to configure the server to connect to an LDAP server. # which are requested from the LDAP server. # to fabric CA attribute values. #         value: attr("uid") =~ "revoker*"
# 'member' which has multiple values of "dn1", "dn2", and "dn3". # Further assume the following configuration. # "group" replaces "dn1" with "orderer" and "dn2" with "peer". filter is a filter to use when searching to convert a login user name to a distinguished name. For example, a value of (uid=%s) searches for LDAP entries with the value of a uid attribute whose value is the login user name. Similarly, (email=%s) may be used to login with an email address. the attribute.converters section is used to convert LDAP attributes to fabric CA attributes, where * fcaAttrName is the name of a fabric CA attribute; * fcaExpr is an expression whose evaluated value is assigned to the fabric CA attribute. For example, suppose that <LDAPAttrs> is [“uid”], <fcaAttrName> is ‘hf.Revoker’, and <fcaExpr> is ‘attr(“uid”) =~ “revoker*”’. This means that an attribute named “uid” is requested from the LDAP server on a user’s behalf. The user is then given a value of ‘true’ for the ‘hf.Revoker’ attribute if the value of the user’s ‘uid’ LDAP attribute begins with ‘revoker’; otherwise, the user is given a value of ‘false’ for the ‘hf.Revoker’ attribute. the attribute.maps section is used to map LDAP response values. The typical use case is to map a distinguished name associated with an LDAP group to an identity type. DN is a variable equal to the user’s distinguished name. affiliation is a variable equal to the user’s affiliation. attr is a function which takes 1 or 2 arguments. The 1st argument is an LDAP attribute name. The 2nd argument is a separator string which is used to join multiple values into a single string; the default separator string is ”,”. The attr function always returns a value of type ‘string’. map is a function which takes 2 arguments. The 1st argument is any string. The second argument is the name of a map which is used to perform string substitution on the string from the 1st argument. if is a function which takes a 3 arguments where the first argument must resolve to a boolean value. If it evaluates to true, the second argument is returned; otherwise, the third argument is returned. For example, the following expression evaluates to true if the user has a distinguished name ending in “O=org1,C=US”, or if the user has an affiliation beginning with “org1.dept2.” and also has the “admin” attribute of “true”. value: attr("gidNumber") =~ "1000[0-5]$" || attr("mail") == "root@example.com"
The following is a sample configuration section for the default setting for the OpenLDAP server whose docker image is at https://github.com/osixia/docker-openldap. See FABRIC_CA/scripts/run-ldap-tests for a script which starts an OpenLDAP docker image, configures it, runs the LDAP tests in FABRIC_CA/cli/server/ldap/ldap_test.go, and stops the OpenLDAP server. The Fabric CA client or client SDK sends an enrollment request with a basic authorization header. The Fabric CA server receives the enrollment request, decodes the identity name and password in the authorization header, looks up the DN (Distinguished Name) associated with the identity name using the “userfilter” from the configuration file, and then attempts an LDAP bind with the identity’s password. If the LDAP bind is successful, the enrollment processing is authorized and can proceed. You may use any IP sprayer to load balance to a cluster of Fabric CA servers. This section provides an example of how to set up Haproxy to route to a Fabric CA server cluster. Be sure to change hostname and port to reflect the settings of your Fabric CA servers. Note: If using TLS, need to use mode tcp. The fabric-ca server by default consists of a single default CA. However, additional CAs can be added to a single server by using cafiles or cacount configuration options. Each additional CA will have its own home directory. Each additional CA will get a default configuration file generated in it’s home directory, within the configuration file it will contain a unique CA name. If absolute paths are not provided when using the cafiles configuration option, the CA home directory will be relative to the server directory. To use this option, CA configuration files must have already been generated and configured for each CA that is to be started. Each configuration file must have a unique CA name and Common Name (CN), otherwise the server will fail to start as these names must be unique. The CA configuration files will override any default CA configuration, and any missing options in the CA configuration files will be replaced by the values from the default CA. In order to create a CA signing certificate for an intermediate CA, the intermediate CA must enroll with a parent CA in the same way that a fabric-ca-client enrolls with a CA. This is done by using the -u option to specify the URL of the parent CA and the enrollment ID and secret as shown below. The identity associated with this enrollment ID must have an attribute with a name of “hf.IntermediateCA” and a value of “true”. The CN (or Common Name) of the issued certificate will be set to the enrollment ID. An error will occur if an intermediate CA tries to explicitly specify a CN value. For other intermediate CA flags see Fabric CA server’s configuration file format section. If using sqlite3, backup the current database file (which is named fabric-ca-server.db by default). For other database types, use the appropriate backup/replication mechanism. Ensure the current database is backed up. Replace previous fabric-ca-server binary with the upgraded version. To upgrade a cluster of fabric-ca-server instances using either a MySQL or Postgres database, perform the following procedure. We assume that you are using haproxy to load balance to two fabric-ca-server cluster members on host1 and host2, respectively, both listening on port 7054. After this procedure, you will be load balancing to upgraded fabric-ca-server cluster members on host3 and host4 respectively, both listening on port 7054. The CA Server hosts an HTTP server that offers a RESTful “operations” API. This API is intended to be used by operators, not administrators or “users” of the network. The address and port to listen on. The TLS certificates and keys to use for authentication and encryption. Note, these certificates should be generated by a separate and dedicated CA. Do not use a CA that has generated certificates for any organizations in any channels. The listenAddress key defines the host and port that the operation server will listen on. If the server should listen on all addresses, the host portion can be omitted. The tls section is used to indicate whether or not TLS is enabled for the operations service, the location of the service’s certificate and private key, and the locations of certificate authority root certificates that should be trusted for client authentication. When clientAuthRequired is true, clients will be required to provide a certificate for authentication. As the operations service is focused on operations and intentionally unrelated to the Fabric network, it does not use the Membership Services Provider for access control. Instead, the operations service relies entirely on mutual TLS with client certificate authentication. It is highly recommended to enable mutual TLS by setting the value of clientAuthRequired to true in production environments. With this configuration, clients are required to provide a valid certificate for authentication. If the client does not provide a certificate or the service cannot verify the client’s certificate, the request is rejected. Note that if clientAuthRequired is set to false, clients do not need to provide a certificate; if they do, however, and the service cannot verify the certificate, then the request will be rejected. When TLS is disabled, authorization is bypassed and any client that can connect to the operations endpoint will be able to use the API. The Fabric CA exposes metrics that can provide insight into the behavior of the system. Operators and administrators can use this information to better understand how the system is performing over time. Fabric CA provides two ways to expose metrics: a pull model based on Prometheus and a push model based on StatsD. A typical Prometheus deployment scrapes metrics by requesting them from an HTTP endpoint exposed by instrumented targets. As Prometheus is responsible for requesting the metrics, it is considered a pull system. When configured, a Fabric CA Server will present a /metrics resource on the operations service. To enable Prometheus, set the provider value in the server’s configuration file to prometheus. StatsD is a simple statistics aggregation daemon. Metrics are sent to a statsd daemon where they are collected, aggregated, and pushed to a backend for visualization and alerting. As this model requires instrumented processes to send metrics data to StatsD, this is considered a push system. The CA Server can be configured to send metrics to StatsD by setting the metrics provider to statsd in the metrics section in servers’ configuration filel. The statsd subsection must also be configured with the address of the StatsD daemon, the network type to use (tcp or udp), and how often to send the metrics. An optional prefix may be specified to help differentiate the source of the metrics — for example, differentiating metrics coming from separate servers — that would be prepended to all generated metrics. For a look at the different metrics that are generated, check out Metrics Reference. This section describes how to use the fabric-ca-client command. The instructions below assume that the client configuration file exists in the client’s home directory. See CSR fields for description of the fields. Then run fabric-ca-client enroll command to enroll the identity. For example, following command enrolls an identity whose ID is admin and password is adminpw by calling Fabric CA server that is running locally at 7054 port. The enroll command stores an enrollment certificate (ECert), corresponding private key and CA certificate chain PEM files in the subdirectories of the Fabric CA client’s msp directory. You will see messages indicating where the PEM files are stored. The identity performing the register request must be currently enrolled, and must also have the proper authority to register the type of the identity that is being registered. The registrar (i.e. the invoker) must have the “hf.Registrar.Roles” attribute with a comma-separated list of values where one of the values equals the type of identity being registered; for example, if the registrar has the “hf.Registrar.Roles” attribute with a value of “peer,app,user”, the registrar can register identities of type peer, app, and user, but not orderer. The affiliation of the registrar must be equal to or a prefix of the affiliation of the identity being registered. For example, an registrar with an affiliation of “a.b” may register an identity with an affiliation of “a.b.c” but may not register an identity with an affiliation of “a.c”. If root affiliation is required for an identity, then the affiliation request should be a dot (”.”) and the registrar must also have root affiliation. If no affiliation is specified in the registration request, the identity being registered will be given the affiliation of the registrar. Registrar can register Fabric CA reserved attributes that have the prefix ‘hf.’ only if the registrar possesses the attribute and it is part of the value of the hf.Registrar.Attributes’ attribute. Furthermore, if the attribute is of type list then the value of attribute being registered must be equal to or a subset of the value that the registrar has. If the attribute is of type boolean, the registrar can register the attribute only if the registrar’s value for the attribute is ‘true’. Registering custom attributes (i.e. any attribute whose name does not begin with ‘hf.’) requires that the registrar has the ‘hf.Registar.Attributes’ attribute with the value of the attribute or pattern being registered. The only supported pattern is a string with a “*” at the end. For example, “a.b. *” is a pattern which matches all attribute names beginning with “a.b.”. For example, if the registrar has hf.Registrar.Attributes=orgAdmin, then the only attribute which the registrar can add or remove from an identity is the ‘orgAdmin’ attribute. If the requested attribute name is ‘hf.Registrar.Attributes’, an additional check is performed to see if the requested values for this attribute are equal to or a subset of the registrar’s values for ‘hf.Registrar.Attributes’. For this to be true, each requested value must match a value in the registrar’s value for ‘hf.Registrar.Attributes’ attribute. For example, if the registrar’s value for ‘hf.Registrar.Attributes’ is ‘a.b. *, x.y.z’ and the requested attribute value is ‘a.b.c, x.y.z’, it is valid because ‘a.b.c’ matches ‘a.b. *’ and ‘x.y.z’ matches the registrar’s ‘x.y.z’ value. If the registrar has the attribute ‘hf.Registrar.Attributes = a.b. *, x.y.z’ and is registering attribute ‘a.b.c’, it is valid ‘a.b.c’ matches ‘a.b.*’. If the registrar has the attribute ‘hf.Registrar.Attributes = a.b. *, x.y.z’ and is registering attribute ‘x.y.z’, it is valid because ‘x.y.z’ matches the registrar’s ‘x.y.z’ value. If the registrar has the attribute ‘hf.Registrar.Attributes = a.b. *, x.y.z’ and the requested attribute value is ‘a.b.c, x.y.z’, it is valid because ‘a.b.c’ matches ‘a.b. *’ and ‘x.y.z’ matches the registrar’s ‘x.y.z’ value. If the registrar has the attribute ‘hf.Registrar.Roles = peer,client’ and the requested attribute value is ‘peer’ or ‘peer,client’, it is valid because the requested value is equal to or a subset of the registrar’s value. If the registrar has the attribute ‘hf.Registrar.Attributes = a.b. *, x.y.z’ and is registering attribute ‘hf.Registar.Attributes = a.b.c, x.y. *’, it is invalid because requested attribute ‘x.y. *’ is not a pattern owned by the registrar. The value ‘x.y. *’ is a superset of ‘x.y.z’. If the registrar has the attribute ‘hf.Registrar.Attributes = a.b. *, x.y.z’ and is registering attribute ‘hf.Registar.Attributes = a.b.c, x.y.z, attr1’, it is invalid because the registrar’s ‘hf.Registrar.Attributes’ attribute values do not contain ‘attr1’. If the registrar has the attribute ‘hf.Registrar.Attributes = a.b. *, x.y.z’ and is registering attribute ‘a.b’, it is invalid because the value ‘a.b’ is not contained in ‘a.b.*’. If the registrar has the attribute ‘hf.Registrar.Attributes = a.b. *, x.y.z’ and is registering attribute ‘x.y’, it is invalid because ‘x.y’ is not contained by ‘x.y.z’. If the registrar has the attribute ‘hf.Registrar.Roles = peer,client’ and the requested attribute value is ‘peer,client,orderer’, it is invalid because the registrar does not have the orderer role in its value of hf.Registrar.Roles attribute. If the registrar has the attribute ‘hf.Revoker = false’ and the requested attribute value is ‘true’, it is invalid because the hf.Revoker attribute is a boolean attribute and the registrar’s value for the attribute is not ‘true’. The table below lists all the attributes that can be registered for an identity. The names of attributes are case sensitive. Note: When registering an identity, you specify an array of attribute names and values. If the array specifies multiple array elements with the same name, only the last element is currently used. In other words, multi-valued attributes are not currently supported. The following command uses the admin identity’s credentials to register a new user with an enrollment id of “admin2”, an affiliation of “org1.department1”, an attribute named “hf.Revoker” with a value of “true”, and an attribute named “admin” with a value of “true”. The ”:ecert” suffix means that by default the “admin” attribute and its value will be inserted into the user’s enrollment certificate, which can then be used to make access control decisions. The password, also known as the enrollment secret, is printed. This password is required to enroll the identity. This allows an administrator to register an identity and give the enrollment ID and the secret to someone else to enroll the identity. Multiple attributes can be specified as part of the –id.attrs flag, each attribute must be comma separated. For an attribute value that contains a comma, the attribute must be encapsulated in double quotes. See example below. The following command would then register a new identity with an enrollment id of “admin3” which it takes from the command line, and the remainder is taken from the configuration file including the identity type: “user”, affiliation: “org1.department1”, and two attributes: “hf.Revoker” and “anotherAttrName”. To register an identity with multiple attributes requires specifying all attribute names and values in the configuration file as shown above. Setting maxenrollments to 0 or leaving it out from the configuration will result in the identity being registered to use the CA’s max enrollment value. Furthermore, the max enrollment value for an identity being registered cannot exceed the CA’s max enrollment value. For example, if the CA’s max enrollment value is 5. Any new identity must have a value less than or equal to 5, and also can’t set it to -1 (infinite enrollments). Next, let’s register a peer identity which will be used to enroll the peer in the following section. The following command registers the peer1 identity. Note that we choose to specify our own password (or secret) rather than letting the server generate one for us. Now that you have successfully registered a peer identity, you may now enroll the peer given the enrollment ID and secret (i.e. the password from the previous section). This is similar to enrolling the bootstrap identity except that we also demonstrate how to use the “-M” option to populate the Hyperledger Fabric MSP (Membership Service Provider) directory structure. The following command enrolls peer1. Be sure to replace the value of the “-M” option with the path to your peer’s MSP directory which is the ‘mspConfigPath’ setting in the peer’s core.yaml file. You may also set the FABRIC_CA_CLIENT_HOME to the home directory of your peer. Enrolling an orderer is the same, except the path to the MSP directory is the ‘LocalMSPDir’ setting in your orderer’s orderer.yaml file. For example, if an identity is of type peer and its affiliation is department1.team1 , the identity’s OU hierarchy (from leaf to root) is OU=team1, OU=department1, OU=peer . In general, the cacerts directory of the MSP directory must contain the certificate authority chains of other certificate authorities, representing all of the roots of trust for the peer. The fabric-ca-client getcainfo command is used to retrieve these certificate chains from other Fabric CA server instances. For example, the following will start a second Fabric CA server on localhost listening on port 7055 with a name of “CA2”. This represents a completely separate root of trust and would be managed by a different member on the blockchain. The following command will install CA2’s certificate chain into peer1’s MSP directory. By default, the Fabric CA server returns the CA chain in child-first order. This means that each CA certificate in the chain is followed by its issuer’s CA certificate. If you need the Fabric CA server to return the CA chain in the opposite order, then set the environment variable CA_CHAIN_PARENT_FIRST to true and restart the Fabric CA server. The Fabric CA client will handle either order appropriately. Identity Mixer (Idemix) is a cryptographic protocol suite for privacy-preserving authentication and transfer of certified attributes. Idemix allows users to authenticate with verifiers without the involvement of the issuer (CA) and selectively disclose only those attributes that are required by the verifier and can do so without being linkable across their transactions. Fabric CA server can issue Idemix credentials in addition to X509 certificates. An Idemix credential can be requested by sending the request to the /api/v1/idemix/credential API endpoint. For more information on this and other Fabric CA server API endpoints, please refer to swagger-fabric-ca.json. IsAdmin - if the user is an admin or not. The value of this attribute is set to the value of isAdmin registration attribute. You can refer to the handleIdemixEnroll function in https://github.com/hyperledger/fabric-ca/blob/master/lib/client.go for reference implementation of the two step process for getting Idemix credential. The /api/v1/idemix/credential API endpoint accepts both basic and token authorization headers. The basic authorization header should contain User’s registration ID and password. If the user already has X509 enrollment certificate, it can also be used to create a token authorization header. Note that Hyperledger Fabric will support clients/users to sign transactions with both X509 and Idemix credentials, but will only support X509 credentials for peer and orderer identities. As before, applications can use a Fabric SDK to send requests to the Fabric CA server. SDKs hide the complexity associated with creating authorization header and request payload, and with processing the response. An Idemix CRI (Credential Revocation Information) is similar in purpose to an X509 CRL (Certificate Revocation List): to revoke what was previously issued. However, there are some differences. In X509, the issuer revokes an end user’s certificate and its ID is included in the CRL. The verifier checks to see if the user’s certificate is in the CRL and if so, returns an authorization failure. The end user is not involved in this revocation process, other than receiving an authorization error from a verifier. In Idemix, the end user is involved. The issuer revokes an end user’s credential similar to X509 and evidence of this revocation is recorded in the CRI. The CRI is given to the end user (aka “prover”). The end user then generates a proof that their credential has not been revoked according to the CRI. The end user gives this proof to the verifier who verifies the proof according to the CRI. For verification to succeed, the version of the CRI (known as the “epoch”) used by the end user and verifier must be same. The latest CRI can be requested by sending a request to /api/v1/idemix/cri API endpoint. The version of the CRI is incremented when an enroll request is received by the fabric-ca-server and there are no revocation handles remaining in the revocation handle pool. In this case, the fabric-ca-server must generate a new pool of revocation handles which increments the epoch of the CRI. The number of revocation handles in the revocation handle pool is configurable via the idemix.rhpoolsize server configuration property. Suppose your enrollment certificate is about to expire or has been compromised. You can issue the reenroll command to renew your enrollment certificate as follows. An identity or a certificate can be revoked. Revoking an identity will revoke all the certificates owned by the identity and will also prevent the identity from getting any new certificates. Revoking a certificate will invalidate a single certificate. In order to revoke a certificate or an identity, the calling identity must have the hf.Revoker and hf.Registrar.Roles attribute. The revoking identity can only revoke a certificate or an identity that has an affiliation that is equal to or prefixed by the revoking identity’s affiliation. Furthermore, the revoker can only revoke identities with types that are listed in the revoker’s hf.Registrar.Roles attribute. For example, a revoker with affiliation orgs.org1 and ‘hf.Registrar.Roles=peer,client’ attribute can revoke either a peer or client type identity affiliated with orgs.org1 or orgs.org1.department1 but can’t revoke an identity affiliated with orgs.org2 or of any other type. The following command disables an identity and revokes all of the certificates associated with the identity. All future requests received by the Fabric CA server from this identity will be rejected. The –gencrl flag can be used to generate a CRL (Certificate Revocation List) that contains all the revoked certificates. For example, following command will revoke the identity peer1, generates a CRL and stores it in the <msp folder>/crls/crl.pem file. A CRL can also be generated using the gencrl command. Refer to the Generating a CRL (Certificate Revocation List) section for more information on the gencrl command. After a certificate is revoked in the Fabric CA server, the appropriate MSPs in Hyperledger Fabric must also be updated. This includes both local MSPs of the peers as well as MSPs in the appropriate channel configuration blocks. To do this, PEM encoded CRL (certificate revocation list) file must be placed in the crls folder of the MSP. The fabric-ca-client gencrl command can be used to generate a CRL. Any identity with hf.GenCRL attribute can create a CRL that contains serial numbers of all certificates that were revoked during a certain period. The created CRL is stored in the <msp folder>/crls/crl.pem file. The following command will create a CRL containing all the revoked certficates (expired and unexpired) and store the CRL in the ~/msp/crls/crl.pem file. The next command will create a CRL containing all certificates (expired and unexpired) that were revoked after 2017-09-13T16:39:57-08:00 (specified by the –revokedafter flag) and before 2017-09-21T16:39:57-08:00 (specified by the –revokedbefore flag) and store the CRL in the ~/msp/crls/crl.pem file. The –caname flag specifies the name of the CA to which this request is sent. In this example, the gencrl request is sent to the default CA. The –revokedafter and –revokedbefore flags specify the lower and upper boundaries of a time period. The generated CRL will contain certificates that were revoked in this time period. The values must be UTC timestamps specified in RFC3339 format. The –revokedafter timestamp cannot be greater than the –revokedbefore timestamp. By default, ‘Next Update’ date of the CRL is set to next day. The crl.expiry CA configuration property can be used to specify a custom value. This section describes in more detail how to configure TLS for a Fabric CA client. The following sections may be configured in the fabric-ca-client-config.yaml. The certfiles option is the set of root certificates trusted by the client. This will typically just be the root Fabric CA server’s certificate found in the server’s home directory in the ca-cert.pem file. The client option is required only if mutual TLS is configured on the server. Access control decisions can be made by chaincode (and by the Hyperledger Fabric runtime) based upon an identity’s attributes. This is called Attribute-Based Access Control, or ABAC for short. In order to make this possible, an identity’s enrollment certificate (ECert) may contain one or more attribute name and value. The chaincode then extracts an attribute’s value to make an access control decision. For example, suppose that you are developing application app1 and want a particular chaincode operation to be accessible only by app1 administrators. Your chaincode could verify that the caller’s certificate (which was issued by a CA trusted for the channel) contains an attribute named app1Admin with a value of true. Of course the name of the attribute can be anything and the value need not be a boolean value. When you register an identity, you can specify that an enrollment certificate issued for the identity should by default contain an attribute. This behavior can be overridden at enrollment time, but this is useful for establishing default behavior and, assuming registration occurs outside of your application, does not require any application change. The following shows how to register user1 with two attributes: app1Admin and email. The ”:ecert” suffix causes the appAdmin attribute to be inserted into user1’s enrollment certificate by default, when the user does not explicitly request attributes at enrollment time. The email attribute is not added to the enrollment certificate by default. When you enroll an identity, you may explicitly request that one or more attributes be added to the certificate. For each attribute requested, you may specify whether the attribute is optional or not. If it is not requested optionally and the identity does not possess the attribute, an error will occur. The following shows how to enroll user1 with the email attribute, without the app1Admin attribute, and optionally with the phone attribute (if the user possesses the phone attribute). fabric-ca-client enroll -u http://user1:user1pw@localhost:7054 --enrollment.attrs "email,phone:opt"
The table below shows the three attributes which are automatically registered for every identity. To add any of the above attributes by default to a certificate, you must explicitly register the attribute with the ”:ecert” specification. For example, the following registers identity ‘user1’ so that the ‘hf.Affiliation’ attribute will be added to an enrollment certificate if no specific attributes are requested at enrollment time. Note that the value of the affiliation (which is ‘org1’) must be the same in both the ‘–id.affiliation’ and the ‘–id.attrs’ flags. This section describes how to use fabric-ca-client to dynamically update portions of the fabric-ca-server’s configuration without restarting the server. All commands in this section require that you first be enrolled by executing the fabric-ca-client enroll command. This section describes how to use fabric-ca-client to dynamically update identities. The client identity must possess the “hf.Registrar.Roles” attribute with a comma-separated list of values where one of the values equals the type of identity being updated; for example, if the client’s identity has the “hf.Registrar.Roles” attribute with a value of “client,peer”, the client can update identities of type ‘client’ and ‘peer’, but not ‘orderer’. The affiliation of the client’s identity must be equal to or a prefix of the affiliation of the identity being updated. For example, a client with an affiliation of “a.b” may update an identity with an affiliation of “a.b.c” but may not update an identity with an affiliation of “a.c”. If root affiliation is required for an identity, then the update request should specify a dot (”.”) for the affiliation and the client must also have root affiliation. The following shows how to add, modify, and remove an affiliation. A caller may retrieve information on a identity from the fabric-ca server as long as the caller meets the authorization requirements highlighted in the section above. The following command shows how to get an identity. A caller may also request to retrieve information on all identities that it is authorized to see by issuing the following command. The following adds a new identity for ‘user1’. Adding a new identity performs the same action as registering an identity via the ‘fabric-ca-client register’ command. There are two available methods for adding a new identity. The first method is via the –json flag where you describe the identity in a JSON string. The following adds a user with root affiliation. Note that an affiliation name of ”.” means the root affiliation. The second method for adding an identity is to use direct flags. See the example below for adding ‘user1’. The table below lists all the fields of an identity and whether they are required or optional, and any default values they might have. There are two available methods for modifying an existing identity. The first method is via the –json flag where you describe the modifications in to an identity in a JSON string. Multiple modifications can be made in a single request. Any element of an identity that is not modified will retain its original value. NOTE: A maxenrollments value of “-2” specifies that the CA’s max enrollment setting is to be used. The command below make multiple modification to an identity using the –json flag. The commands below make modifications using direct flags. The following updates the enrollment secret (or password) for identity ‘user1’ to ‘newsecret’. The following updates the affiliation of identity ‘user1’ to ‘org2’. The following updates the type of identity ‘user1’ to ‘peer’. The following updates the maxenrollments of identity ‘user1’ to 5. By specifying a maxenrollments value of ‘-2’, the following causes identity ‘user1’ to use the CA’s max enrollment setting. The following sets the value of the ‘hf.Revoker’ attribute for identity ‘user1’ to ‘false’. If the identity has other attributes, they are not changed. If the identity did not previously possess the ‘hf.Revoker’ attribute, the attribute is added to the identity. An attribute may also be removed by specifying no value for the attribute. The following removes the ‘hf.Revoker’ attribute for user ‘user1’. The following demonstrates that multiple options may be used in a single fabric-ca-client identity modify command. In this case, both the secret and the type are updated for user ‘user1’. The following removes identity ‘user1’ and also revokes any certificates associated with the ‘user1’ identity. Note: Removal of identities is disabled in the fabric-ca-server by default, but may be enabled by starting the fabric-ca-server with the –cfg.identities.allowremove option. This section describes how to use fabric-ca-client to dynamically update affiliations. The following shows how to add, modify, remove, and list an affiliation. The client identity must possess the attribute ‘hf.AffiliationMgr’ with a value of ‘true’. The affiliation of the client identity must be hierarchically above the affiliation being updated. For example, if the client’s affiliation is “a.b”, the client may add affiliation “a.b.c” but not “a” or “a.b”. The following adds a new affiliation named ‘org1.dept1’. If the ‘–force’ option is true and there are identities which must be modified, the client identity must also be authorized to modify the identity. The following renames the ‘org2’ affiliation to ‘org3’. It also renames any sub affiliations (e.g. ‘org2.department1’ is renamed to ‘org3.department1’). If there are identities that are affected by the renaming of an affiliation, it will result in an error unless the ‘–force’ option is used. Using the ‘–force’ option will update the affiliation of identities that are affected to use the new affiliation name. The affiliation of the client identity must be hierarchically above the affiliation being updated. For example, if the client’s affiliation is “a.b”, the client may remove affiliation “a.b.c” but not “a” or “a.b”. The following removes affiliation ‘org2’ and also any sub affiliations. For example, if ‘org2.dept1’ is an affiliation below ‘org2’, it is also removed. If there are identities that are affected by the removing of an affiliation, it will result in an error unless the ‘–force’ option is used. Using the ‘–force’ option will also remove all identities that are associated with that affiliation, and the certificates associated with any of these identities. Note: Removal of affiliations is disabled in the fabric-ca-server by default, but may be enabled by starting the fabric-ca-server with the –cfg.affiliations.allowremove option. Affiliation of the client identity must be equal to or be hierarchically above the affiliation being updated. For example, if the client’s affiliation is “a.b”, the client may get affiliation information on “a.b” or “a.b.c” but not “a” or “a.c”. The following command shows how to get a specific affiliation. A caller may also request to retrieve information on all affiliations that it is authorized to see by issuing the following command. This section describes how to use fabric-ca-client to manage certificates. If the caller possesses the hf.Registrar.Roles attribute or the hf.Revoker attribute with a value of true, all certificates which belong to identities in and below the caller’s affiliation. For example, if the client’s affiliation is a.b, the client may get certificates for identities who’s affiliation is a.b or a.b.c but not a or a.c. If executing a list command that requests certificates of more than one identity, only certificates of identities with an affiliation that is equal to or hierarchically below the caller’s affiliation will be listed. The certificates which will be listed may be filtered based on ID, AKI, serial number, expiration time, revocation time, notrevoked, and notexpired flags. You can use flags notexpired and notrevoked as filters to exclude revoked certificates and/or expired certificates from the result set. For example, if you only care about certificates that have expired but have not been revoked you can use the expiration and notrevoked flags to get back such results. An example of this case is provided below. Time should be specified based on RFC3339. For instance, to list certificates that have expirations between March 1, 2018 at 1:00 PM and June 15, 2018 at 2:00 AM, the input time string would look like 2018-03-01T13:00:00z and 2018-06-15T02:00:00z. If time is not a concern, and only the dates matter, then the time part can be left off and then the strings become 2018-03-01 and 2018-06-15. The string now may be used to denote the current time and the empty string to denote any time. For example, now:: denotes a time range from now to any time in the future, and ::now denotes a time range from any time in the past until now. The following command shows how to list certificates using various filters. The “–notexpired” flag is equivalent to “–expiration now::”, which means certificates will expire some time in the future. The list certificate command can also be used to store certificates on the file system. This is a convenient way to populate the admins folder in an MSP, The “-store” flag points to the location on the file system to store the certificates. By default, the Fabric CA server and client store private keys in a PEM-encoded file, but they can also be configured to store private keys in an HSM (Hardware Security Module) via PKCS11 APIs. This behavior is configured in the BCCSP (BlockChain Crypto Service Provider) section of the server’s or client’s configuration file. This section shows how to configure the Fabric CA server or client to use a software version of PKCS11 called softhsm (see https://github.com/opendnssec/SoftHSMv2). You can find example configuration file named softhsm2.conf under testdata directory. Create a token, label it “ForFabric”, set the pin to ‘98765432’ (refer to softhsm documentation). You can use both the config file and environment variables to configure BCCSP For example, set the bccsp section of Fabric CA server configuration file as follows. Note that the default field’s value is PKCS11. A default configuration file is created in the server’s home directory (see Fabric CA Server section for more info). The following link shows a sample Server configuration file. A default configuration file is created in the client’s home directory (see Fabric CA Client section for more info). The following link shows a sample Client configuration file. You issue a fabric-ca-client enroll command, creating an enrollment certificate (i.e. an ECert). This stores a copy of the ECert in the fabric-ca-server’s database. The fabric-ca-server’s database is deleted and recreated, thus losing the ECert from step ‘a’. For example, this may happen if you stop and restart a docker container hosting the fabric-ca-server, but your fabric-ca-server is using the default sqlite database and the database file is not stored on a volume and is therefore not persistent. You issue a fabric-ca-client register command or any other command which tries to use the ECert from step ‘a’. In this case, since the database no longer contains the ECert, the [ERROR] No certificates found for provided serial and aki will occur. To resolve this error, you must enroll again by repeating step ‘a’. This will issue a new ECert which will be stored in the current database. When sending multiple parallel requests to a Fabric CA Server cluster that uses shared sqlite3 databases, the server occasionally returns a ‘database locked’ error. This is most probably because the database transaction timed out while waiting for database lock (held by another cluster member) to be released. This is an invalid configuration because sqlite is an embedded database, which means the Fabric CA server cluster must share the same file via a shared file system, which introduces a SPoF (single point of failure), which contradicts the purpose of cluster topology. 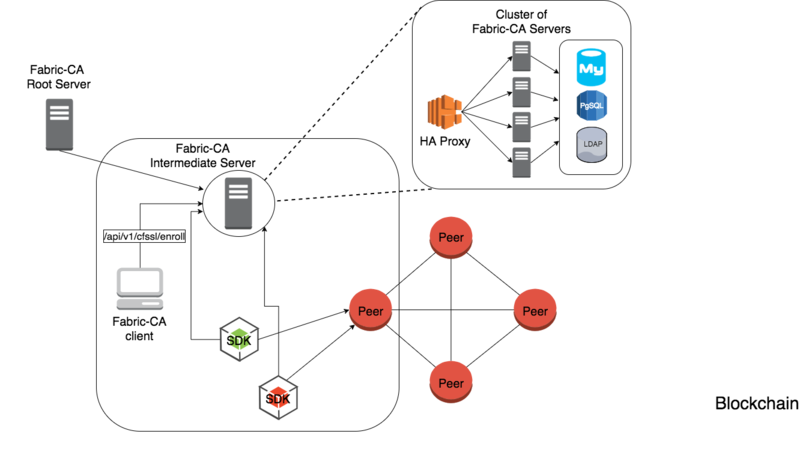 The best practice is to use either Postgres or MySQL databases in a cluster topology. Suppose an error similar to Failed to deserialize creator identity, err The supplied identity is not valid, Verify() returned x509: certificate signed by unknown authority is returned by a peer or orderer when using an enrollment certificate issued by the Fabric CA Server. This indicates that the signing CA certificate used by the Fabric CA Server to issue certificates does not match a certificate in the cacerts or intermediatecerts folder of the MSP used to make authorization checks. The MSP which is used to make authorization checks depends on which operation you were performing when the error occurred. For example, if you were trying to install chaincode on a peer, the local MSP on the file system of the peer is used; otherwise, if you were performing some channel specific operation such as instantiating chaincode on a specific channel, the MSP in the genesis block or the most recent configuration block of the channel is used. To confirm that this is the problem, compare the AKI (Authority Key Identifier) of the enrollment certificate to the SKI (Subject Key Identifier) of the certificate(s) in the cacerts and intermediatecerts folder of appropriate MSP. The command openssl x509 -in <PEM-file> -noout -text | grep -A1 “Authority Key Identifier” will display the AKI and openssl x509 -in <PEM-file> -noout -text | grep -A1 “Subject Key Identifier” will display the SKI. If they are not equal, you have confirmed that this is the cause of the error. You used cryptogen to generate your key material but did not start fabric-ca-server with the signing key and certificate generated by cryptogen . Copy crypto-config/peerOrganizations/<orgName>/ca/*pem to $FABRIC_CA_SERVER_HOME/ca-cert.pem . Copy crypto-config/peerOrganizations/<orgName>/ca/*_sk to $FABRIC_CA_SERVER_HOME/msp/keystore/ . Delete any previously issued enrollment certificates and get new certificates by enrolling again. You deleted and recreated the CA signing key and certificate used by the Fabric CA Server after generating the genesis block. This can happen if the Fabric CA Server is running in a docker container, the container was restarted, and its home directory is not on a volume mount. In this case, the Fabric CA Server will create a new CA signing key and certificate. Assuming that you can not recover the original CA signing key, the only way to recover from this scenario is to update the certificate in the cacerts (or intermediatecerts ) of the appropriate MSPs to the new CA certificate.